Tuesday, April 21 at 6:30 p.m. 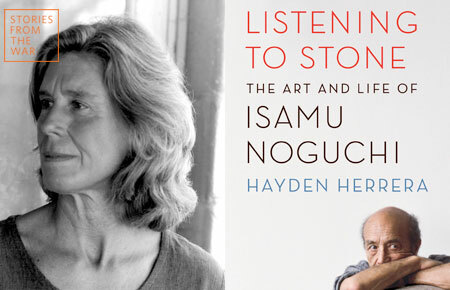 In Meet the Artist: Listening to Stone: The Art and Life of Isamu Noguchi by Pulitzer Prize-nominated biographer Hayden Herrera, Herrera (Frida: A Biography of Frida Kahlo, Arshile Gorky: His Life and Work) discusses Noguchi’s conflicting duality, why she chose Noguchi as the subject of her major new biography, and why she thinks Noguchi is somewhat neglected compared to other American artists of his generation. As part of Japan Society’s ongoing Stories from the War series, marking the 70th anniversary of the end of WWII, the talk will also touch on how Noguchi’s personal and creative life was affected by the war. For example, according to the Noguchi Museum, Noguchi founded the Nisei Writers and Artists Mobilization for Democracy in 1942 to raise awareness of the patriotism of Japanese Americans, and famously asked to be placed in an internment camp in Arizona, where he lived for seven months. Moderated by acclaimed art critic and author Dr. Irving Sandler, a contributing editor at Art in America, the talk is followed by a reception. Dr. Sandler is the author of numerous publications including four surveys of art since World War II: The Triumph of American Painting: A History of Abstract Expressionism, The New York School: Painters and Sculptors of the 1950s, American Art of the 1960s, and Art of the Postmodern Era: From the late 1960s to the Early 1990s. In 2008, he received the Lifetime Achievement Award in Art Criticism from the International Association of Art Critics. Japan Society’s Stories from the War series encompasses theater performances, film screenings, lectures, panels, themed language classes, and educational opportunities for young people. Programming explores history and considers challenging issues that the U.S. and Japan faced surrounding WWII. Through a range of perspectives and narratives, Stories from the War touches on women’s issues, patriotism, life during war, nuclear weapons, propaganda, nationalism, Japanese American internment, selective memory, democracy and more. The series also shows how contemporary Japanese and American artists and scholars are still much influenced by WWII. To purchase tickets, please visit Japan Society’s website or call the Box Office at 212.715.1258.